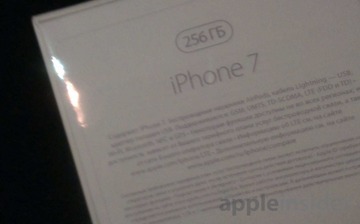 The alleged "iPhone" box pictures were sent to AppleInsider on Thursday, and show details for a 256-gigabyte "iPhone 7." Like Thursday's leaked packaging, the new pictures claim that wireless "AirPods" are included with the phone but this time included with the smaller "iPhone 7," instead of just with the "iPhone 7 Plus." Only one of the pictures has a clear focus. While the "AirPods" are listed as included, the Lightning to headphone jack adapter depicted on other box picture leaks is not listed. Casting some doubt on authenticity, the label on the back of the box is also clearly a sticker. 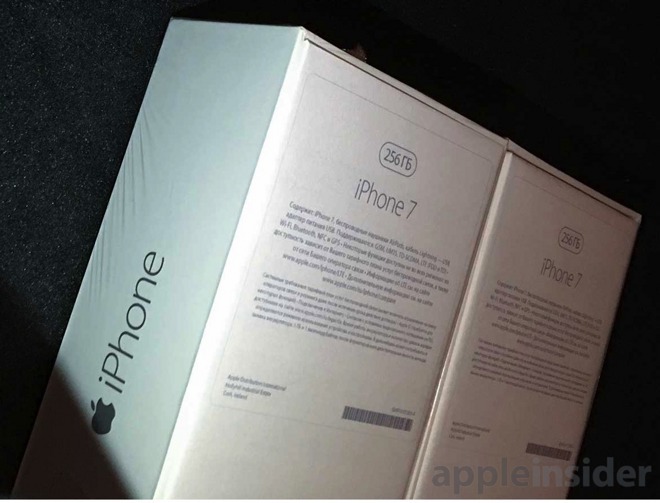 Apple has recently been printing directly on the box backs, with the shift to printed packaging and away from a sticker on the box taking place with the launch of the iPhone 6. 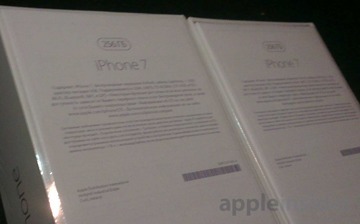 The text is centered on the sticker, also in contrast to iPhone 6 and 6s packaging having left-justified text. And recent iPhone models have not printed the product name large at the top of the box, like is shown in the latest Russian leak. However, some Apple products in the past have had centered text and a large product name printed on the back of the box, including the iPad mini 2 and Apple Watch. Despite the images appearing to be from a shrink-wrapped pair of retail boxes for the device, paper "proof" listing box contents is easy to forge. The images, if legitimate, could indicate Apple will have a staggering amount of individual model numbers, spanning not just models, but colors, capacities, and now the choice of wired or wireless bundled earbuds. The company has been rumored for some time to have completely wireless earbuds in development, with no tethering wire spanning the two buds. A recent regulatory filing confirmed the rumors that the wireless earbuds are called "AirPods," in a slight alteration of the original wired "EarPods" name. The new "iPhone 7" is expected to be revealed during Apple's Sept. 7 event. New models are rumored to be slightly thinner design than the iPhone 6 family, made possible by removing the analog headphone jack, necessitating wireless or Lightning earbuds. The larger 5.5-inch "Plus" variant has been said for some time to feature a dual-lens camera design, and 3 gigabytes of application RAM.